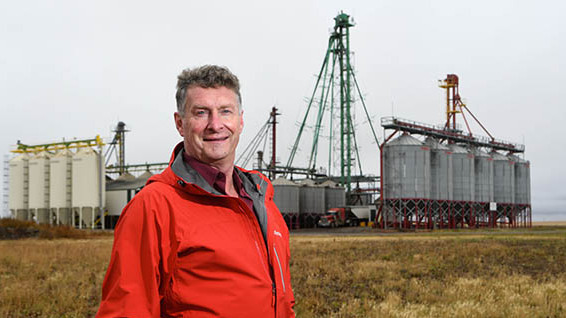 From local trucking through large egg production to international feed production, O&T Farms has been a leader in Western Canada’s agricultural sector for 50 years. The company currently provides Omega-3 rich feed components to the world through its patented product and technology. “It’s about keeping your eyes open, having a desire to learn and grow, and an overall willingness to change,” said Tim Wiens, President of O&T Farms. O&T Farms was founded by brothers Ted and Oscar Wiens in the late 1960s initially as a Manitoba trucking company, which transported cream and eggs from Manitoba producers to the Canada Safeway processing plant in Winnipeg. By 1967, recognizing an emerging opportunity, Ted moved to Saskatchewan and established an egg farm that would supply Safeway’s Saskatchewan market, while Oscar continued to run their trucking company. Over time, O&T Farms’ egg production grew. By 1974, Oscar and Ted had sold the trucking company, and Oscar had joined Ted in Saskatchewan to concentrate on the growing enterprise. The company grew to become one of the largest egg producers in Western Canada. By the mid-80s, Ted began to focus on developing international markets. It was as a result of this new international market focus that the company then bought AgDevCo, a provincial Crown Corporation, and began working on agri-value projects overseas. At the same time, always interested in enhancing the nutritional quality of its hens and eggs, the O&T Farms team began looking at ways to enhance the nutritional quality of the feed provided to their birds. The team began experimenting with the use of nutritional feed supplements such as pulses and flax, monitoring the results on their hens and eggs. Through this process, they were able to refine their product into a highly nutritional feed for their birds. Interested in turning their findings into a saleable product, the company began looking at how they might market the new feed supplement. O&T Farms invested heavily in dry extrusion processes, which allowed it to develop high-quality, nutritionally enhanced feed ingredients rich in healthy Omega-3 fatty acids. It also began working with universities on product testing. It soon became apparent that with its expertise in feed, and its ability to test its products on its own flocks, O&T Farms was well-positioned to serve an emerging market for nutritionally-enhanced livestock feed ingredients, derived from grains and oilseeds. Burnbrae Farms, the Ontario-based egg producer, became O&T Farms’ first important customer. Since that time, sales have grown steadily. Today, O&T Farms produces seven feed product lines, including its flax-based linPRO ™, which is sold to the largest egg producers in the US. “It’s about innovation and value added. We’re taking farmers’ products, adding value and sending them all over the world,” said O&T Farms CEO Elan Ange. In 2014, O&T Farms hired a specialist in animal and poultry science, continuing to partner with universities, undertaking nutritional studies and trials on its products, and focusing on improving the nutritional value of those products. This recent work has enabled the organization to expand into a new marketing direction, allowing it to serve different sectors of the livestock industry, and offering its customers the ability to develop other Omega-3 enriched egg, meat and dairy products. Because of the volume of feed shipped, O&T Farms leases its own rail cars. “All of our new markets are being served by rail,” says Wiens. Today, O&T’s list of customers includes many international egg producers, including the US brand leader Eggland’s Best. Besides the United States, the company currently exports its Omega-3 enhanced feed products into Korea, China, Thailand, Bangladesh, Morocco and the United Arab Emirates, and holds patents for its products in over 40 countries. The company continues to focus on innovation and growth. Over the past four years, O&T Farms has moved into the dairy market with its linPRO-R™ product that is currently being tested at two American universities for its nutritional benefits in relation to better health and increased conception rates in dairy cows. “It’s all about proving our value to meet our customers’ needs, and we’ve done that pretty well,” said Wiens. He is proud of the company’s resilience and is confident that O&T Farms will continue to adapt and lead in the ever-changing international food market well into the future.